Successfully Added Disguised Pen-Shaped Electronic Cigarette to your Shopping Cart. Stop harming your body with tobacco cigarettes when this Pen-Shaped Electronic Cigarette offers you the same thing, but with little to no adverse health effects! Electronic cigarettes are high-tech, non-flammable products developed to provide smokers with a safer and healthier alternative to regular tobacco. Everything fully imitates the process of smoking, including the emission of a vapor mist (which does not contain tar, carbon monoxide, or many of the other harmful materials that are found in normal tobacco cigarettes) as well giving smokers the nicotine they crave. Best of all, this alternative to tobacco smoke is 100% safe for you, and those around you, as second hand smoking is no more, so feel free to satisfy your cravings whenever you want, wherever you want. With the new Pen-Shaped Electronic Cigarette, you can now secretly puff away at work. Eyes are everywhere so puffing in your office cubicle with even a normal electronic cigarette can be hard, but no one will be the wiser as you "chew" on your pen for a few secret smokes. In fact, you could even take a few secret puffs while in a meeting or hanging around colleagues. 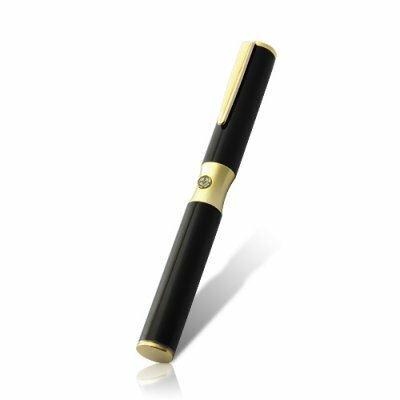 With its completely inconspicuous looks, this Pen-Shaped Electronic Cigarette is perfect for office workers, police officers, teachers, lawyers, and anyone else for whom smoking traditional cigarettes (or even other electronic cigarettes) isn't convenient. With next-day shipping and a variety of international couriers, order the Pen-Shaped Electronic Cigarette today and you'll be well on your way to a healthier lifestyle. Brought to you by Chinavasion, the leader in China wholesale electronic cigarettes. Note: In certain countries this may be considered a medical product by Customs. Before purchasing this item, please check your local laws and import restrictions for this type of device. Electronic cigarettes do not contain tar or other carcinogenic substances. Unlike normal cigarettes, you can take 2-3 puffs to satisfy your cravings. There is no need to finish an entire cigarette. Not a fire hazard like regular cigarettes. Can I import these into my country? It is best to check with the customs department of your country for the correct answer. We may be able to offer alternate labeling on our shipments if it makes it more convenient for you to ship this product into your region. Is the e-cigarette safe to smoke around my children? This e-cigarette produces vapors not smoke. It's definitely safer since there's no tar involved. Received it,charged it...and didnt light a real cigarette since! Taste is good,a bit sweet even,my 1st refills last only 1 day so far though...got to get more. Get more right away if you buy any e-cigs...lots more!They are cheap anyways.